Shopping can be logical. I want a functional can opener, not one with character. But when it comes to sacred tools, magical supplies, and special gifts, character is everything. How does it make you feel? Another word for character is Spirit. 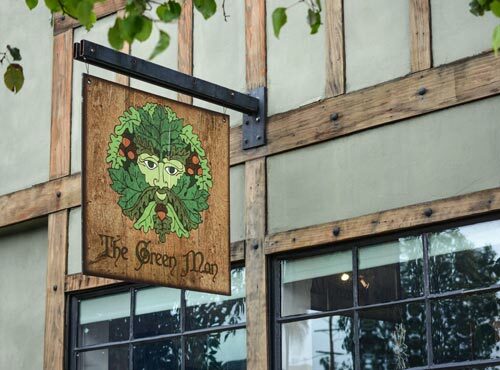 The Green Man is a place to touch, to smell, and to experience the things you seek for your spiritual journey. Ring every bell and see which tone makes your heart sing. Hold a crystal ball and see if the fissures and reflections tell a story. You want to work with white sage to clear a space, but which white sage bundle wants to work with you? Our ancestors used what they had and what they found in the forest when they needed ingredients for their magic or medicine. That said, there’s great joy and power in working with the same plants, oils and trinkets that have been used for generations: Hawthorn berry, High John root, Horseshoe nails…. Our Apothecary stocks more than 500 unique herbs, roots, oils, and curios. We hope you’ll come in soon and enjoy our selection of art, books, candles, cloaks, cauldrons, crystals and minerals, divination tools, essential oils, herbs and curios, jewelry, and statuary. We try to give you space while you shop, but please do let us know if you have any questions. Staff members are seasoned practitioners with extensive knowledge in the use of our items. If you’re not the do-it-yourself type or if you need a hand, we will charge and dress candles and charm bags tailored to your needs. Learn more about Our Spellcrafting Services. If you’d like a private consultation, appointments are available. We have a large upstairs area with private offices for psychic readings, metaphysical healing, and spiritual advisement from our family of over 30 unique practitioners. Consultations are such a big part of our service to the community that our practitioners have their own website: The Green Man Psychics & Healers. Staff & Practitioner Elysia makes her potent Naughty Faery stick incenses in a number of intoxicating scents including Blissful Sleep, Dragon Power, Faery Forest, Success, Drunken Faery, and seasonal scents. We are blessed to have the powerful and popular White Sage as part of our native ecosystem. Our sage and smudge bundles are ethically wildharvested and tied in sacred ceremony by local families. Try the white sage + lavender bundles! For small altars or quick workings, we stock chime candles, votives, and tea lights. For spellcrafting we have classic figure candles including skulls, couples, cats, men, women, and fertility shapes as well as 7-day knob candles. We hand pour lidded jar candles imbued with some of our most popular oil blends, such as Dragon’s Blood, Money Draw, Harvest Home, and the essential Mercury Retrograde. We love candle magic! We enjoy dressing and blessing candles for spells so much that we decided to hand pour our own pillars in over fifty colors and color-combinations to make sure we’ve got the perfect hue for every job. Pumpkin + sky blue + chocolate brown for house blessings. Black + red + white for un-crossing. If you’re looking for ambiance you can find cheaper candles elsewhere, but you can only get hand-poured Yellow Jackets, Road Openers, and Passionate Love pillars at The Green Man. Our 100% pure paraffin wax is firm and smooth, the ideal texture for beautiful carving and dressing. We carve and dress hundreds of candles each month for our customers, so the perfect texture matters to us, too! We use only lead-free wicks and pure oils. We carry crystals and minerals in a range of sizes and price points. We have an especially large collection of tumbled stones and chips for use in spellcrafting, for carrying in the pocket, or for jewelry. You can’t even buy a bottle of soda for under a dollar, but you can take home a piece of Red Jasper (good for protection and courage, and lucky for actors!) from The Green Man. We offer a large selection of crystals wire-wrapped in silver, copper and bronze for use as necklaces or pendulums. We have strands of crystals for necklaces and bracelets as well as pre-drilled stones that you can put on your own leather or chain. We respect crystals as our elders, unsurpassed in beauty, wisdom, and memory. Although you can feel and communicate with a point or a sphere or a cluster, we also carry a selection of stones carved into the shape of a skull. These crystal skulls, because they have been given a human form, are especially adept at communicating with humans! Our stones are all hand-selected in-person for their energy and beauty by our Mistress of Minerals, Jill. Our trays are marked with the magical and energetic properties of each variety of crystal, but please feel free to ask if you have any questions. We also sell books on the magical uses of crystals and offer classes and crystal readings. One can make powerful magic with a cup of tea or table salt, but there’s joy and power in working with the plants, oils and trinkets that have been used for generations: Hawthorn berry, Celtic sea salt, Lucky Hand root, Van Van oil, Magnetic sand. The Green Man stocks more than 500 unique herbs, roots, oils, and curios. Click here to view a list of our usual inventory. We strive to offer only the freshest ethically-grown or wild-harvested items. When possible we prefer to procure items from trusted local spiritual practitioners. We know whose tree our rowan wood comes from, and we know the family that collects and ties our white sage in ceremony. We are staffed by magical practitioners; however our apothecary is also a resource for practitioners of medicinal herbalism. Questions about herbs as complementary medicine? Classes and private consultations are available with renowned Master Herbalist Julie James. A rose by any other name doesn’t always smell as sweet. Essential and fragrance oil producers vary, and the best rose supplier may not be the best rosemary supplier. We try them all and carry only the best of over 200 single oils as well as traditional and house-made blends. Essential oils are market price, but we offer many craft and conjure oils for only $8.00 a dram, so that no one has to go without Psychic Protection, Un-Crossing, Money Draw, Heart’s Ease, or other helpful blends. If you’re looking for a specific book, then you’ll order it online, yeah? But what if you don’t know which book you need? We think this world still has need of brick and mortar bookstores, places where you can let your fingers walk across the spines of unfamiliar titles until you find one that feels right. That feeling of flipping through the pages, choosing a line by instinct and seeing if there’s a message and sense of connection. If you’re looking for books for your spiritual journey, you need a space to engage your spiritual senses. I logically decided to learn more about Crystals, but now I’m standing here and I can’t put down this book about Runes…it just smells right. Our bookshelves represent depth rather than breadth. We don’t have everything, but we have our favorites in many magical and metaphysical areas of interest. We carry the books we love and love to recommend. Some of our books are only sold by independent publishers. Some are hard-to-find titles that we import from overseas. In addition to reading materials, we also carry Psychic Reading materials! We have several full shelves of both modern and traditional tarot, rune, ogham, and oracle decks. Looking for greeting cards for that magical someone? We carry art cards by a variety of artists. We are the only store in the US that carries cards, books, and Goddess Wheels by UK artist Wendy Andrew. We present and host rituals and sacred ceremonies every week, so we have a good sense of what our community needs and wants for their workings. As you can see above, we have you covered on candles, incense & smudge, crystals, herbs, oils, and books. We also have all of the associated tools to go with those things, empty candle jars, incense burners, incense charcoals, mortar & pestles, empty charm bags for stones and herbs, quills for carving candles and much more. We carry statuary representing spiritual traditions from around the world: Bronze Age, Buddhist, Celtic, Christian, Egyptian, Faery, Greek, Hindu, Norse, Occult, Neo-Pagan, Paleolithic, Roman, and Wiccan. To complete your sacred altar we have a selection of altar cloths, candle holders, chalices, blades (athame and sickle), bells, wands, and rattles, as well as multiple sizes of fire-worthy pre-seasoned iron cauldrons. Cloaks are both magical and practical; we offer a variety of weights and colors. For “ultra-light weight occasions” we offer colorful sarongs that can be tied and worn many ways, or used as wall hangings or altar cloths. Whimsical crowns of woven branches and blooms by Elysia can bring out the faery in anyone, not to mention that it’s important to keep your hair out of your face when dancing around a fire! You are welcome to select necklaces, pendants, bracelets, rings, earrings, and other jewelery for their beauty, or to compliment your outfit. But sacred jewelry can also be selected for its magical and spiritual properties. Did you know some traditions wear silver for the Moon or that black tourmaline protects the wearer from negative energy? We offer a diverse array of talismans, religious symbols, amulets, charms, and filigree bells in silver, bronze, and copper, some set with semiprecious stones and crystals. All of the properties we associate with crystals for healing, energetic support, and magic apply when crystals are strung as a bracelet or necklace. Some would say the effect of small stones is amplified when they are worn close to the skin. We offer hollow spiral “cages” that you can stretch to put in and remove small crystals. You can wear a different crystal in your cage every day of the week, depending on what your spirit needs! We also have talented local wire-wrappers who will create a custom pendant from the crystal of your choosing. Looking for something softer? Our feather earrings and hair pieces are hand-crafted by a local artisan. They are guaranteed 100% cruelty free. The ancient art of Divination is more than predicting the future, it is the art of using a ritual tool to attain direct and divine inspiration and knowledge. It may be an understanding of what is to come, but it can also be an understanding of oneself, of spiritual mysteries and truths, or of ancestral legacy. Towards the goal of divine understanding, we offer tarot decks and oracle decks. We’re a bit tarot-obsessed at The Green Man and frequently offer classes on the topic and have written many blogs on the classic imagery. Many ancient alphabets are used for divination, primarily by pulling lots from a bag. We currently have hand-carved rune and ogham lots carved into wood or stone. We carry books to help you learn these ancient systems of “throwing bones.” (In some cases, actual bits of bone were used, but the phrase refers to the “bones of fate” and the ability to see divine order and movement.) We have an assortment of beautiful pendulums, all nicely weighted and balanced for clear communication. Many of our pendulums are so lovely that customers put them onto longer chains so that they can wear them as necklaces. Looking for a deeper well? We have dowsing rods from a local metalsmith.